I've become a bit of a non-fiction junkie. I think it's because I can put down those type books without feeling mortal peril about what's happening to a character. Don't worry, I'm still a big fan of fiction, but I have to schedule it in because when I'm immersed in a story, it's a struggle to re-enter the real world until I know all has been resolved (aka: completing the book). 1. Is Everyone Hanging Out Without Me? by Mindy Kaling. I expected to be laughing hysterically the entire way through, but some of the parts were slow for me. However, the parts that were funny were REALLY funny. 2. The Creative Habit by Twyla Tharp. I'll be honest, I didn't love this one. Maybe I just didn't get it but it felt like a half-written memoir trying to be a how-to book. I kept waiting for the steps and it never got there. 3. Choose Yourself by James Altucher. Okay, I know that title sounds a little narcissistic but the jest of the book is more about helping you strive to be a better version of you. It's a vulnerable and inspiring book. 4. 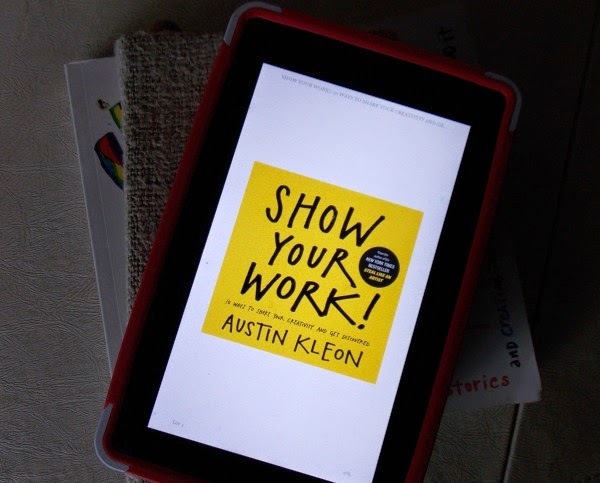 Show Your Work by Austin Kleon. I loved his last book and I love this one! I always finish his books feeling motivated and ready to do work. 5. Budget Bytes by Beth Moncel. She has an amazing way of making cooking seem easy. Her recipes are made with simple ingredients and she makes it affordable. Easy and affordable? Sign. me. up! What are you reading lately? Any books you'd highly recommend?